WASHINGTON ?While some members of Congress would like to see NASA launch the SolarProbePlus mission by 2015, agency officials say they lack the funding neededtofinish and fly the solar spacecraft before 2018. "Thisis a $1.2 billion program," said Richard Fisher, heliophysics divisionchief for NASA's Science Mission Directorate here, of the car-sized solarspacecraft. "We don't getenough budgetbetween now and 2015 to launch it. That was an idea, but it's aconcept; it isn'ta real possibility." NASA's currentheliophysics budget of nearly $630million pays for morethan a dozen ongoing missions, including the $850 million SolarDynamicsObservatory that launched in February, and funds development of fourmoremissions slated to launch between 2012 and 2014. Under thespending plan NASA sent to Congress in February, the heliophysicsdivision'sbudget is forecast to steadily rise to $750 million by 2015. A big partof thatplanned increase is expected to go to the Living with a Star program,underwhich NASA is funding preliminary work on Solar Probe Plus. 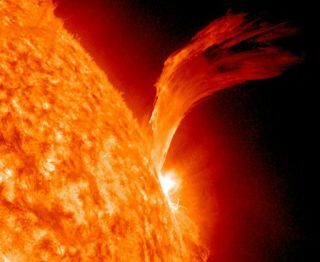 Solar scientistsfor decades have wanted to send a probe plunging into the sun'satmosphere, buttechnical and funding challenges have long stood in the way. In 2003,theNational Research Council called on NASA to build and launch aflagship-class solar probe within 10years, estimating the costof the mission at $650 million. As themission concept has evolved over the past several years, the price taghasrisen considerably as NASA and the Johns Hopkins Applied PhysicsLaboratory inLaurel, Md., came to terms over what it will take to build a600-kilogramflagship solar observatory designed to survive the brutal temperatureswings itwill encounter as it approaches the sun. During atwo-day public meeting of the NASA Advisory Council heliophysicssubcommitteeSept. 20-21, Fisher said he expects building, launching and operatingsuch atechnically challenging mission to cost between $1.1 billion and $1.3billion. "Wehave to not undertake more than we can complete in that cost envelope,and wehave to launch it on time because the planetary windows are 19 monthsapart,"Fisher told the panel. NASA plannedto spend just $4 million on Solar Probe Plus in 2010 but Congressrequired the agencyto spend $40 million. Fisher said the additional $36 million, whichNASA had totake out of other heliophysics programs, is being used to fund variousSolarProbe Plus design and mission requirement studies. Congress hasyet to pass any spending bills for 2011, but draft legislation approvedby theSenate Appropriations Committee in July approved NASA's plan to spendjust $14million on Solar Probe Plus next year even as it included a provisionrequiringNASA to keep the mission on track for a 2015 launch. NASA hasbudgeted a total of $420 million for Solar Probe Plus over the nextfive years,well under half what it would need to spend to make a 2015 launch. While NASA'sannual spending on Solar Probe Plus will not exceed $100 until 2013undercurrent plans, Fisher said the agency is taking important steps now toensurethe mission's success. InSeptember, NASA picked the five science investigations that willcomprise theSolar Probe Plus mission. The agency said it plans to invest $180million inthe selected proposals for preliminary analysis, design, developmentand tests. Fisher saidthe Solar Probe Plus suite of instruments must not exceed 40 kilogramsandrequire no more than 40 watts of power. Thisarticle was provided by Space News, dedicated tocovering all aspects ofthe space industry.